Questions about white privilege and white supremacy abound. Charlottesville highlighted this reality. The NFL protests offer another vantage point. Much is made of the 81% of so-called white evangelicals who voted for Donald Trump. Even as Americans of European descent, especially Northern European descent, lose their dominance, we see great angst expressed. This leads us to the Mormon community, an American born religion, whose sacred book speaks of a "white and delightsome people." Martin Marty points us to conversations happening in and around the LDS community regarding their racial history, especially since the Church of Jesus Christ of Latter Day Saints has become a global religion, whose membership is likely more non-white than white. I offer this up for your conversation. I need to add that as I grew up several of my friends were Mormons, and I always found them gracious and honorable. I share this because it reminds us that we all have histories that require our attention, and which might cause us grief. Hopefully, in time we will find a better way forward. Mormons, members of the Church of Jesus Christ of Latter-day Saints, represent only about two percent of the American people, but “everybody” knows something or other about them. Ask your neighbor to discuss the Christian Church (Disciples of Christ) or the Moravian Church, or many others, and you will get a blank stare. But the Mormons? They are different. They have been visible as a persecuted minority. More happily, the Mormon Tabernacle Choir is familiar to millions. Not a few Mormons are celebrities. Given their square and wholesome manner, many Saints have a good reputation, including as neighbors, even next door (if not as missionary ringers of your doorbell). Those of us who study and teach American religious history and have occasion to tell the Mormon story notice that whenever something unfamiliar shows up in cultural trends, Mormons are spotlighted. Their polygamous practices of old forced American legislators and courts to do some special defining and revising. When the civil rights of “special” religious groups are contested, Mormons still make Page One (as do Jehovah’s Witnesses, Christian Scientists, and others). For all these reasons, there is no surprise that Mormon whiteness is newly discussed at a time when alt-right agitators and Charlottesville demonstrators have provoked discussion of the meaning of “white.” Thanks to the tireless and imaginative efforts of the Public Religion Research Institute, etc., the public learns more and more about the fact that white Protestant America is now, for the first time, a minority group, both much sought after and much disdained by political vote-seekers, while campus movements in the Black Lives Matter moment cause the Mormon situation to be reappraised. Let me recommend a journalistic effort by Emma Green in The Atlantic, which provides a convenient introduction to the issue of racial change. Her headline refers to Mormon history: “When Mormons Aspired to Be a ‘White and Delightsome’ People.” The canonical Book of Mormon includes the word of promise that these Saints would be a “white and a delightsome people.” Such an appeal could not pass in our pluralistic scene. Beginning in the 1970s, as Green reminds us, the Mormons stopped excluding blacks from full participation in LDS life. Green also introduces readers to a new book, Max Perry Mueller’s Race and the Making of the Mormon People, which unearths the buried stories of black Mormons such as Jane Manning James, who was close to Mormon founders like the (Joseph) Smith family. James had all the right ideas and spiritual vibes, but was limited because of her skin color. In an interview, Green and Mueller unfold many meanings of the blacks-as-Mormons story. Mueller: “I’ve been predicting that Mormons will occupy spaces abandoned by white evangelicals: spaces of patriotism, family values, and morality that, unfortunately, some white evangelicals” have abandoned as they have bought into current political, white-Christian-nationalist projects. - Green, Emma. “When Mormons Aspired to Be a ‘White and Delightsome’ People.” The Atlantic. September 18, 2017. - Mueller, Max Perry. 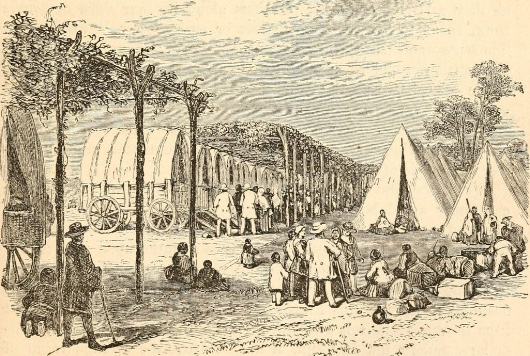 Race and the Making of the Mormon People. University of North Carolina Press, 2017.